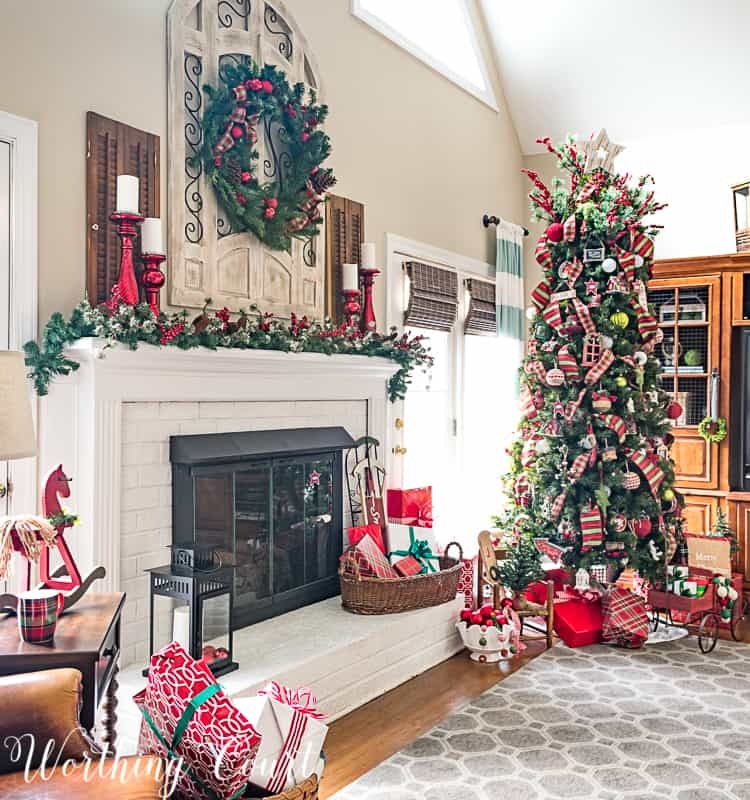 Celebrate Christmas in my cozy and festive family room decorated with rich reds and greens and a just a little bit of sparkle. When I decorate for Christmas, I generally don’t just put a touch here and a touch there. 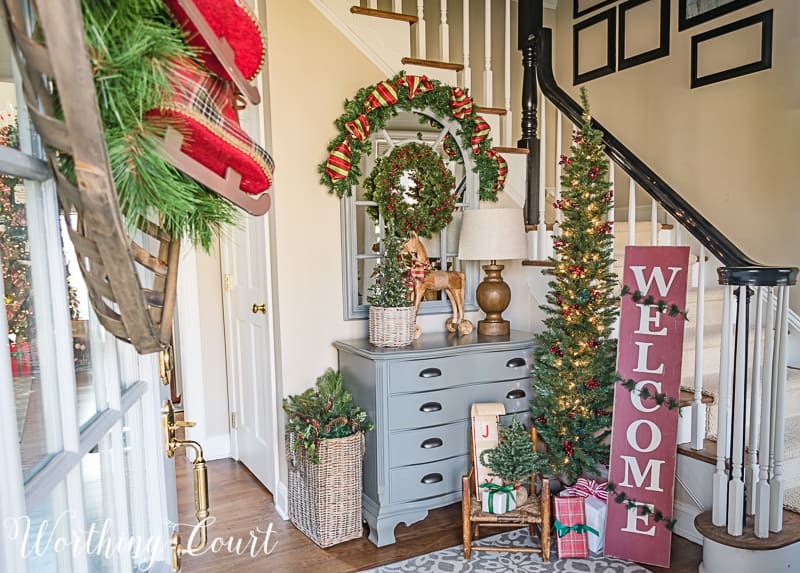 Nope – when I decorate for Christmas, I DECORATE FOR CHRISTMAS! 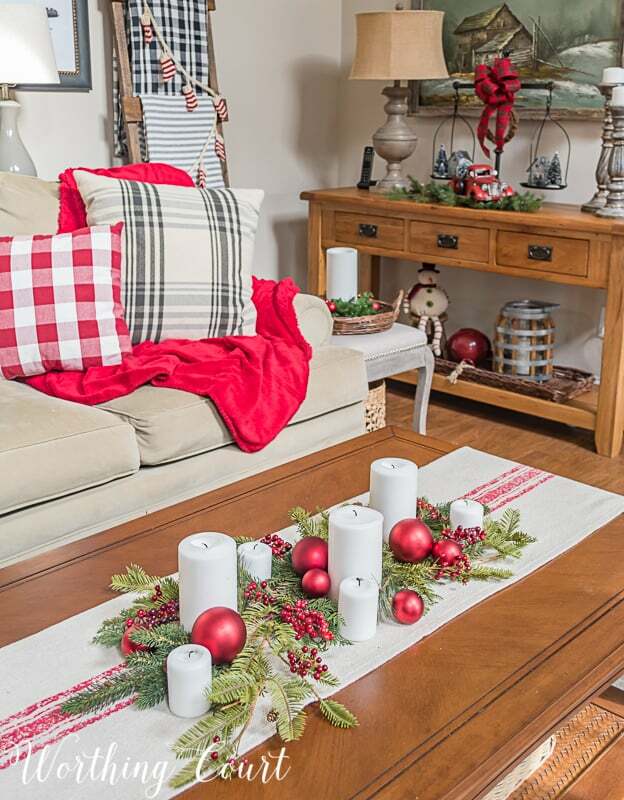 😀 My family room is filled with touches of Christmas throughout the entire space. My tree is filled with bright and cheery Christmas red and green and some amazing silk ribbon. For variety, I used two different patterns and widths of the same ribbon – the narrower ribbon is checked and the wider ribbon is striped. 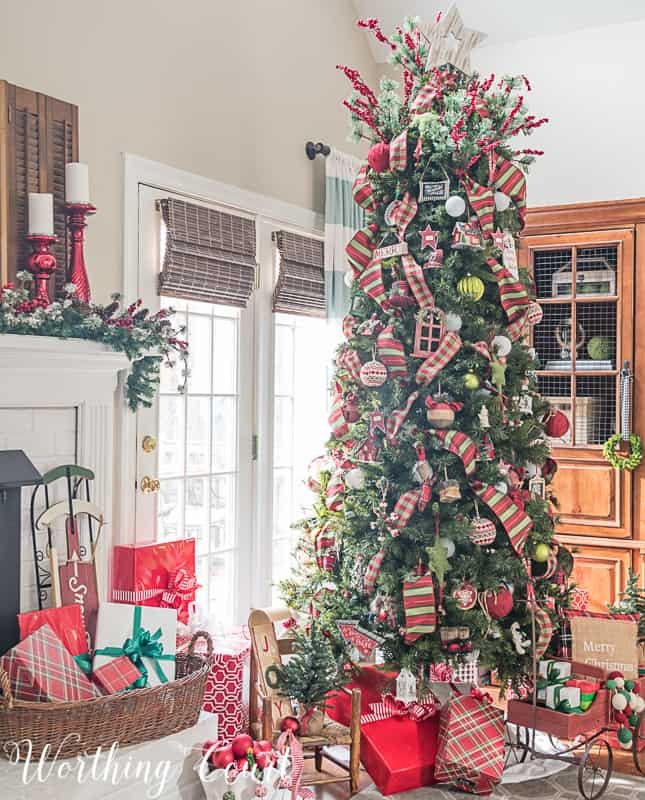 I think that the ribbon is what pulls the whole tree together and gives it its casual elegance vibe. I took the time to go through all of my ornaments, one by one, and only use the ones that fit with my festive Christmas theme this year. All different shades of reds and greens made the cut. 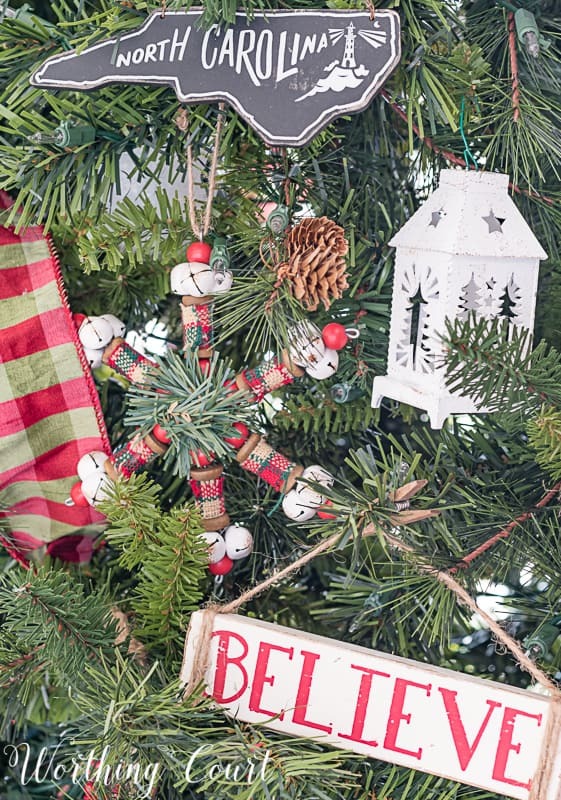 Pops of white, sprinkled throughout brighten the tree and keep it from looking too dark. 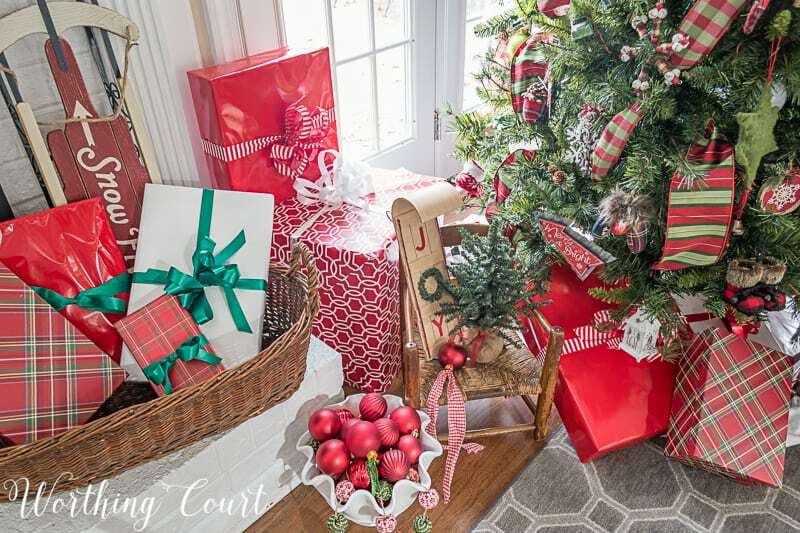 Underneath the tree, you’ll find all of the presents wrapped in coordinating red and white wrapping paper and pops of green added with the ribbon on some of the presents. 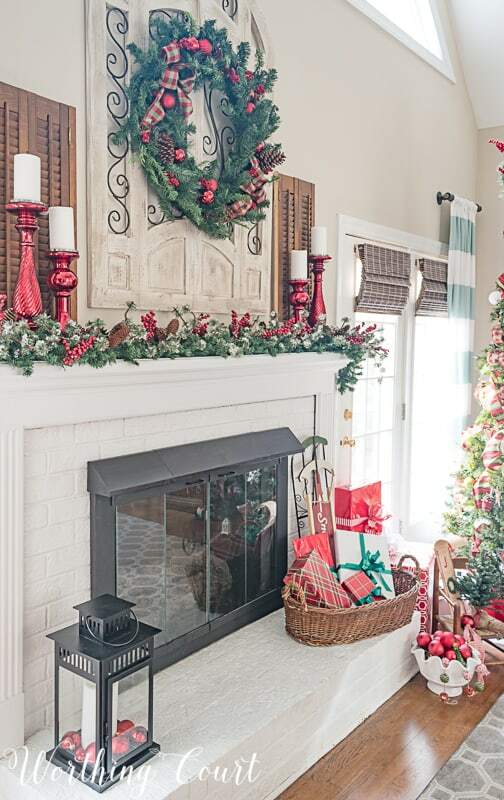 The fireplace seems to just be an extension of the tree. 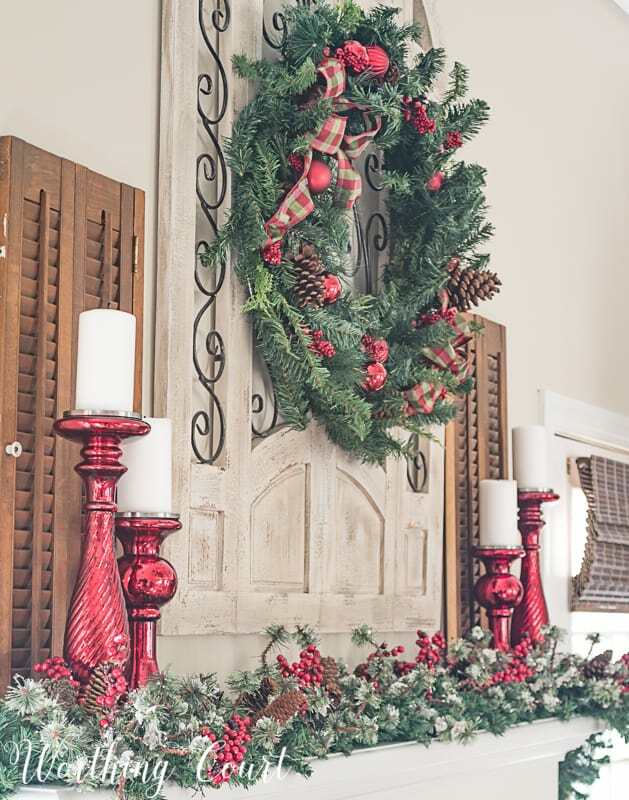 I draped an inexpensive garland across the mantel and tucked in lots of frosted red berry picks. The wreath was super simple to make! First I added a couple of bows, made with the same checked ribbon as is on the tree, and then just tucked in a few red ornaments. I love the look of the shiny red and the satin red ornaments mixed together. The real stars of the mantel though are these gorgeous red mercury glass candlesticks. They were a little bit of a splurge, but ooooh, I love them! I’m already thinking ahead to where I can use them next Christmas. 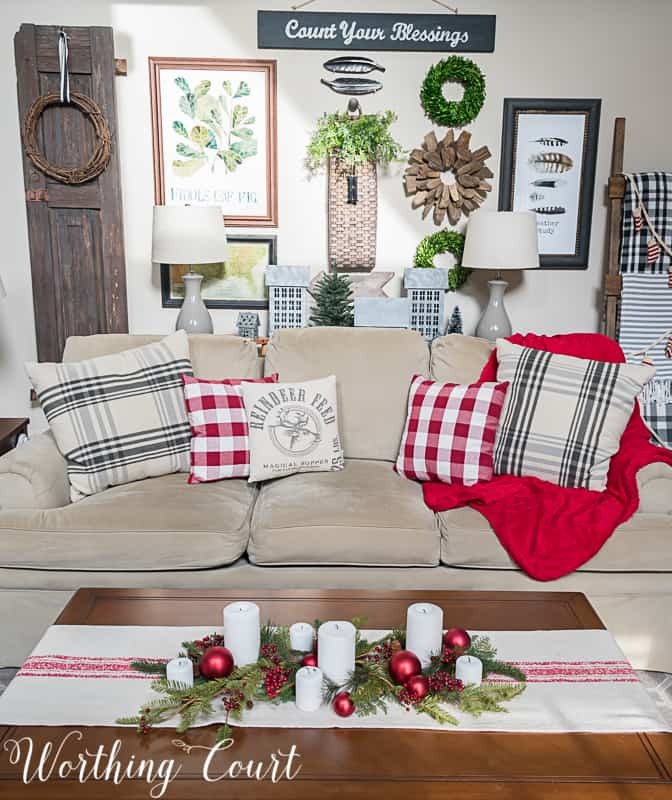 The sofa is filled with a variety of pillows – some Christmas’y and some are just plaid flannel. A grouping of tin houses is nestled on the sofa table behind the couch. These little guys are in such an awkward place to photograph, but I wanted you to see them. 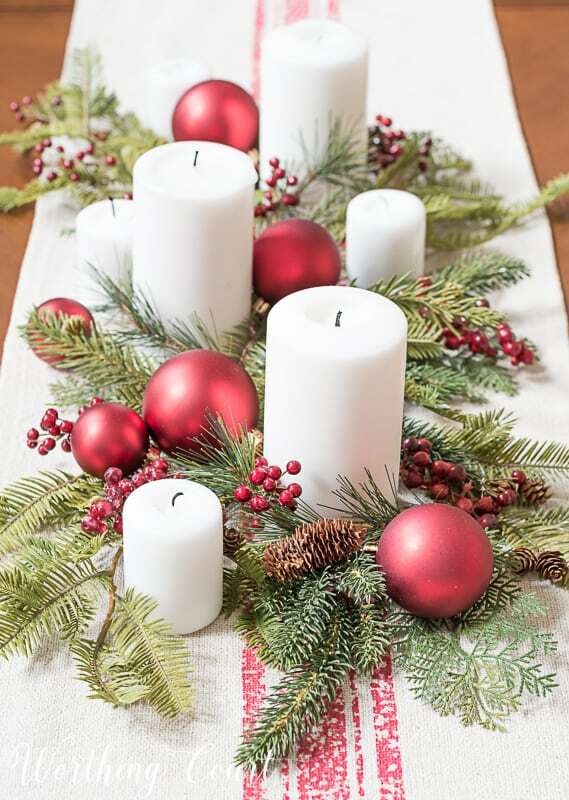 I kept my coffee table very simple by arranging white candles, faux greenery and red berries on top of a grain sack’ish table runner. 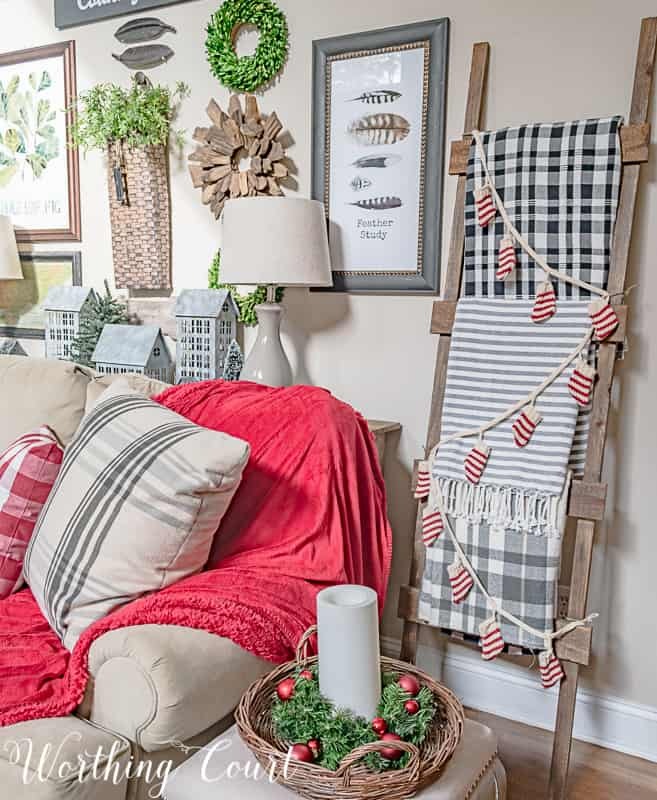 …and added a cute little stocking garland to my blanket ladder. Thank you so much for stopping by to spend some time in my family room today! Your whole house looks so beautiful decorated for Christmas! Your pictures brought such a feeling of coziness and warmth to me. Your home is so festive, warm and welcoming. Love you holiday decorating. Your home looks so festive. There is something to be said for red and green for the holidays. Oh my gosh! I love the little Christmas stocking garland! Can you share where you found it? Hi Annie. I found it at Michael’s just the other day! I love it! Your home is so inviting & cozy. Love all the beautiful ideas you share with us. Happy Holiday! LOVE this ! Thank you for adding some color into your decor! 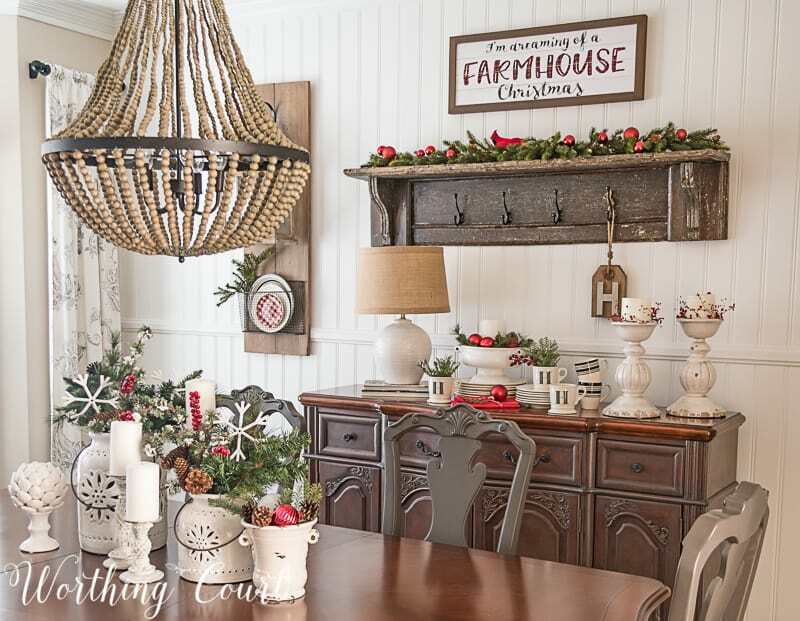 I’ve seen many beautiful holiday decors BUT it seems sooooo many are sticking with white! And while that isn’t bad it kinda is getting old (for me anyway) So nice to see this color in your home.. Just love it ! 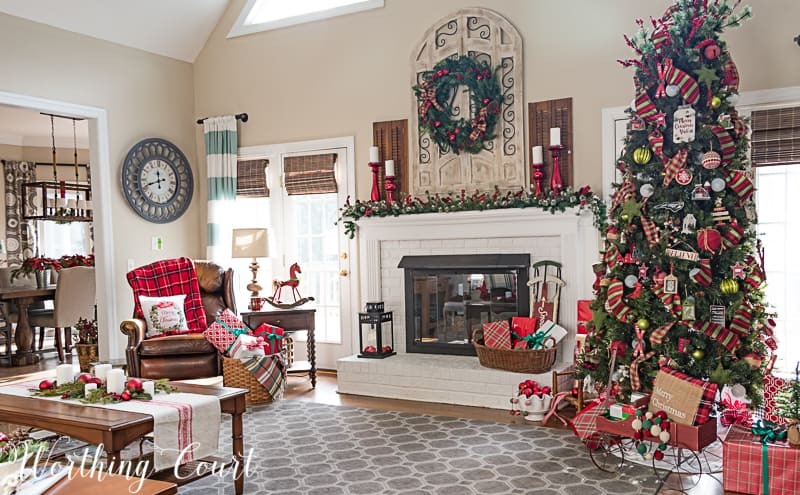 I love how you’ve decorated your family room for Christmas! 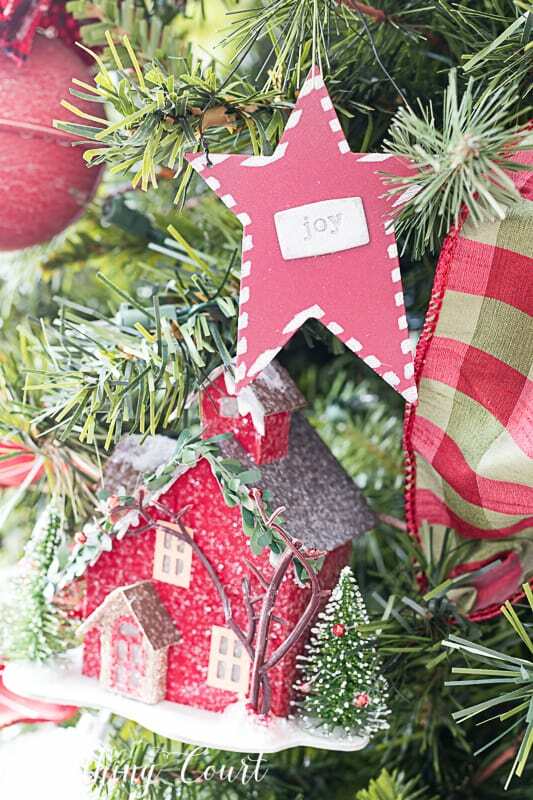 I love your Christmas tree – the ornaments and the topper!!! instead of the shabby chic rooms that are so numerous. Love your eclectic fusion with grain sack linens, black and red checked pillows and everything in between. Have a wonderful Christmas. Thank you so much, Karen. The ribbon is all in pieces that are roughly 3′ long. I start out by pushing one end of the ribbon way back into the tree and secure it by wrapping a branch around it. Then I kind of let it fall where it may. About halfway down, I push it back into the tree and secure it with another branch. At the end of the ribbon, I repeat the same process – push the end back into the tree and secure it by wrapping it with another branch. Hope this helps! 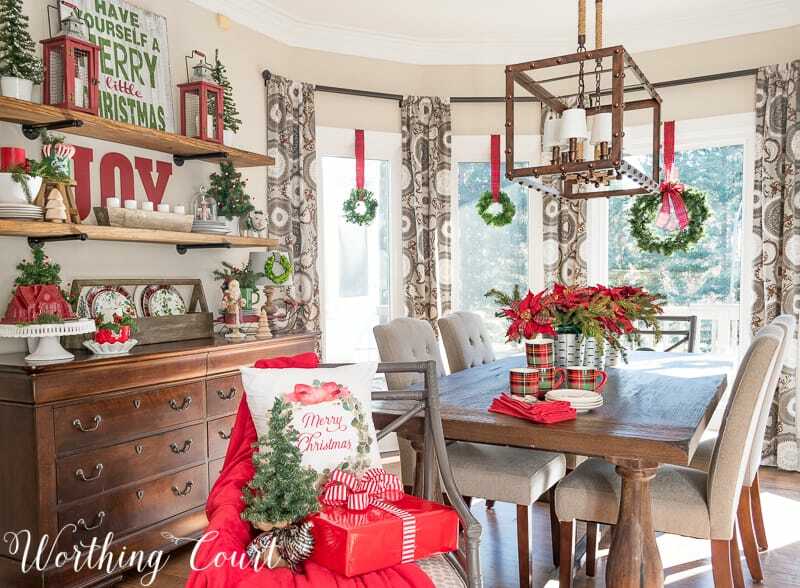 I plan to decorate for Christmas this weekend you blog gives me such Great Ideas and Inspires me! 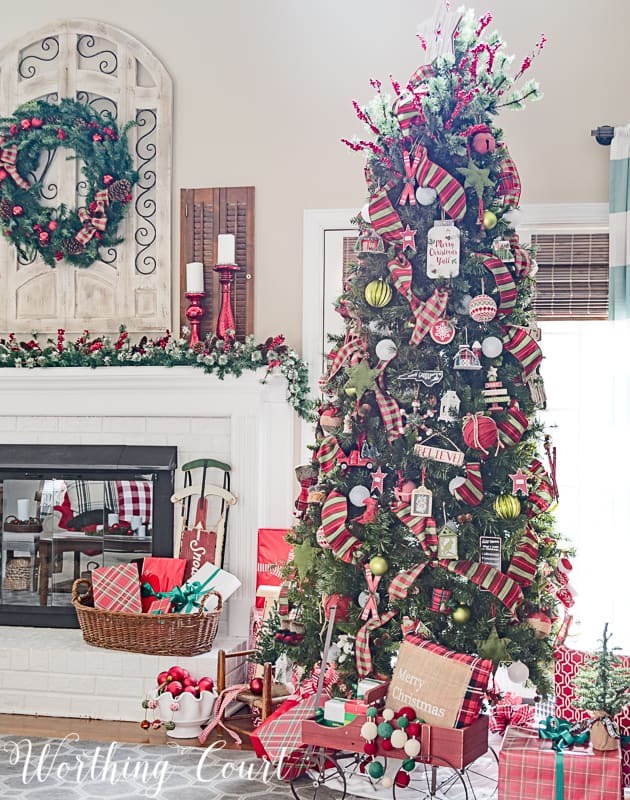 You have totally captured the Christmas spirit in decorating your home. Very warm and inviting. 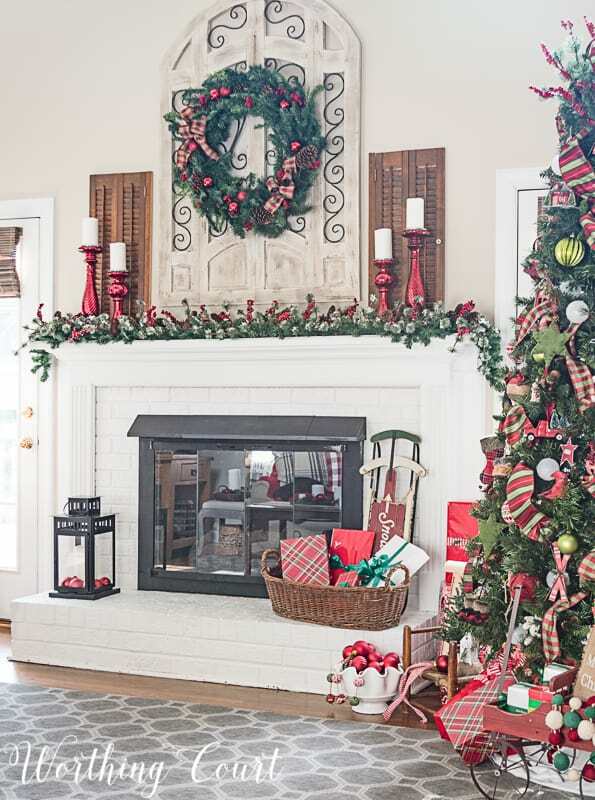 I love your mantel and tree, beautiful! 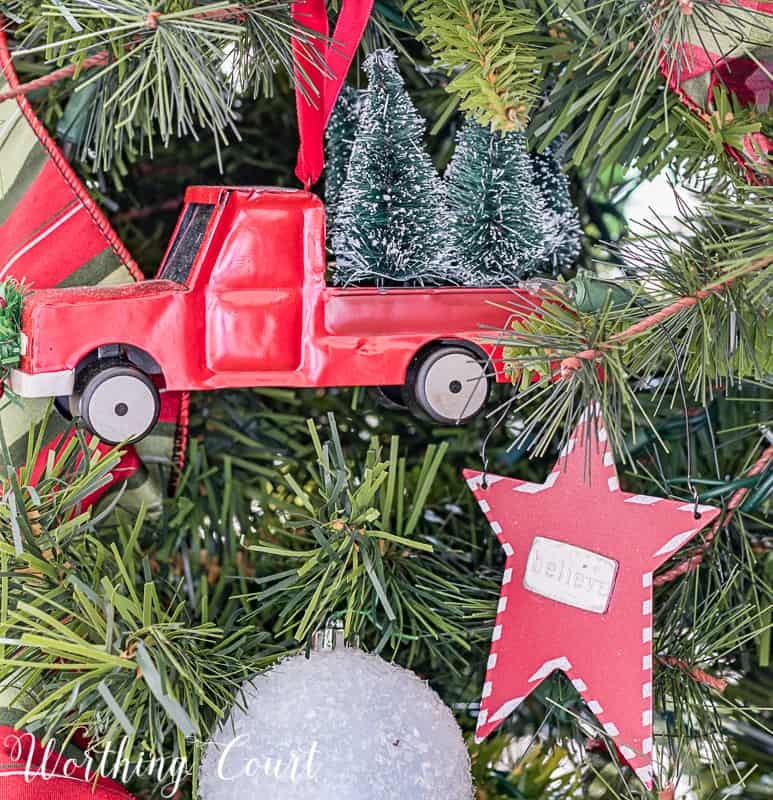 I just recently found your blog and I’m truly enjoying all the beautiful Christmas decorations. Love it all, your tree is stunning. Wow Suzy, you really did decorate for Christmas! 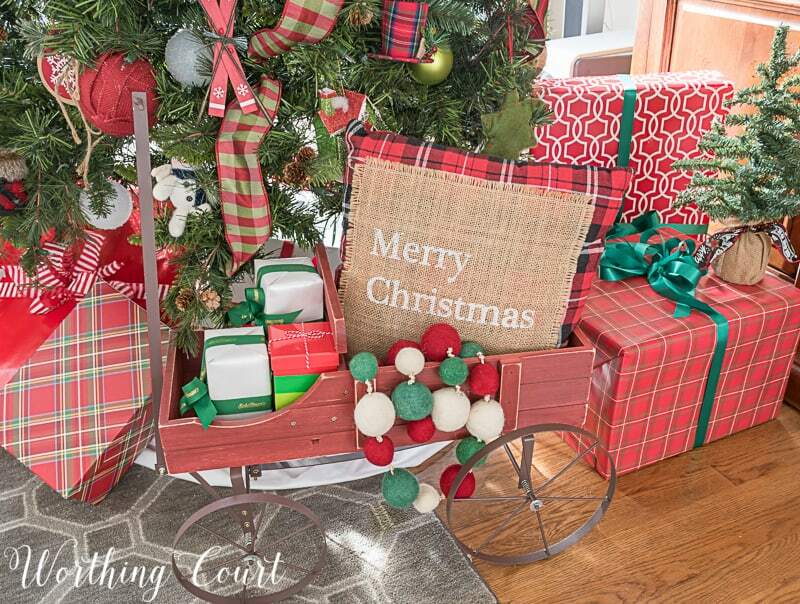 I really think that styling for Christmas is so individual to each person’s style. You have to go with what you love, or it won’t feel right to you. Love all your red and green though. Blessings!! Stunning! All my ornaments are red except those personal ones. Your home is so grand! Where did uou get those red mercury candle sticks? I’m over the moon for them. They are the perfect touch there. Hi Jauquetta. Aren’t those candlesticks awesome??? I found them at At Home last month. I really enjoyed the tour of your home and especially love the tobacco basket with the cute ice skates on your door. Soooo cute! Thank you, Martha! 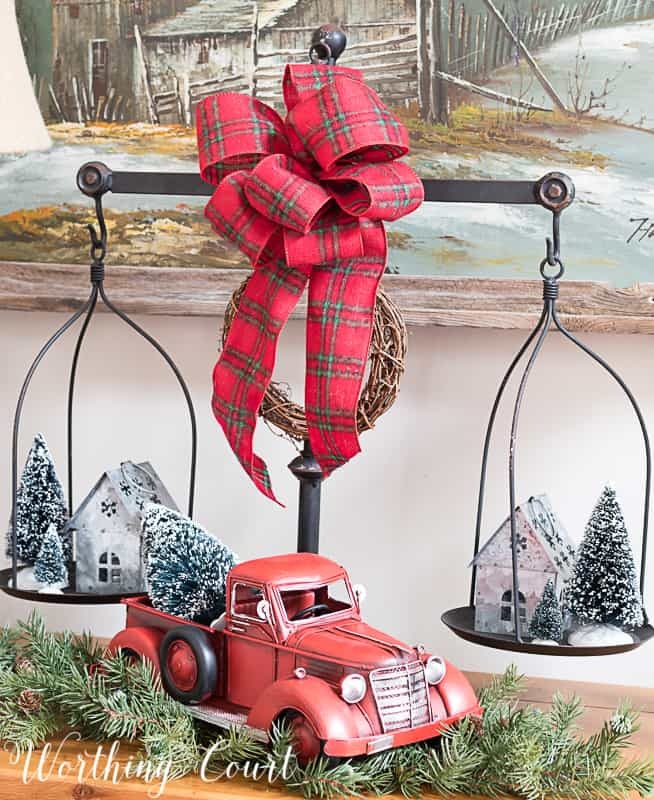 Let’s see – the truck came from Hobby Lobby (not in the Christmas section), the large houses came from At Home last year. I’m sorry, but I don’t remember for sure where the small houses came from – probably At Home or Hobby Lobby. I love it! Thanks for the inspiration. 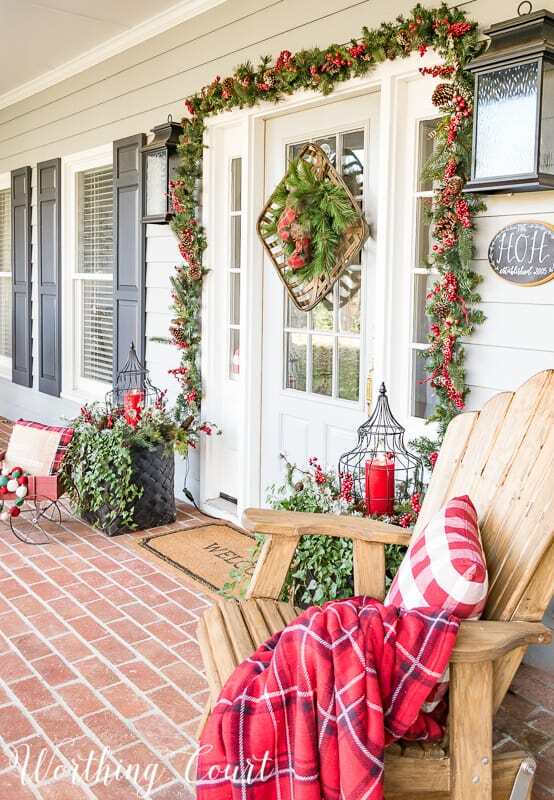 Your home is quintessential Christmas. It makes me smile and full of Christmas joy! Nice job! Love it all! Like the tobacco basket on the front door! Love the breakfast nook ! I love your decorations! I agree that the color is so nice to see . The white is beautiful but just says winter to me. I like having a warm cozy feeling in my home. Nice job!!! Your tree is beautiful, but I’m in love with the candle sticks on your mantel. They make everything pop. Hope you had a Merry Christmas, and I’m wishing you a Happy and Blessed New Year. 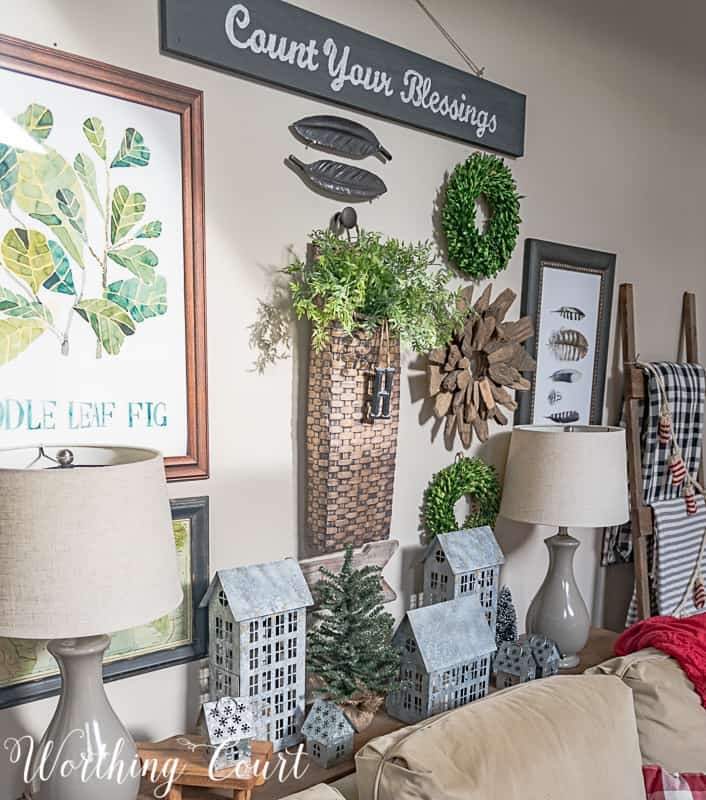 You should consider switching your curtain panels out when you switch out our seasonal decor. Curtain panels are so easy to change! Think about it! That aqua color is a buzz kill for the holidays.